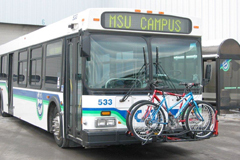 Byk-Rak LLC is one of two companies in North America dedicated to manufacturing bicycle racks for use by the transit industry. We incorporate four main elements to ensure compatibility with transit agencies requirements. 1. Easy of Operation for riders. 2. Economical Design. 3. Durable construction “Commercial Grade”. 4. Compatibility with current Transit Maintenance Operations. At Byk-Rak, we bring together the cyclist and the transit communities.